The Georgian cookbook of our unknown ladies was not only used to record recipes for puddings, pies and other dishes for the dining table. The ladies also noted down home cures for a number of ailments. Today, we’re taking a look at some of the medicines they may have turned to when winter started to bite. As with other the medicinal recipes in the Cookbook, we’d advise you not to try these ones at home! A pint of rose water, ten grains of white powder of vitriol. Wash frequently with it. White vitriol, otherwise known as zinc sulphate, inhibits the production of eye secretions and is still used in eye drops today. The rosewater would have been selected not only for its fragrance, but also for its anti-inflammatory properties. 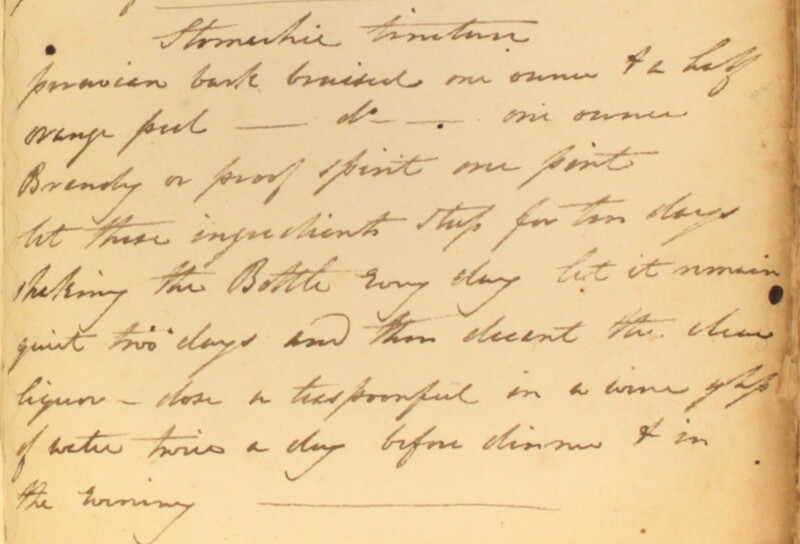 This remedy was unlikely to cure the common cold, but the measures of rum and honey may have gone some way to brighten the patient’s spirits! If you overindulged at a barbecue over the weekend, you’ll probably emphasise with the sickly soul for whom today’s ‘stomachic tincture’ was intended. This home-made medicine includes Peruvian bark. Its source is the cinchona tree, from which bitter-tasting quinine is also produced. Catholic missionaries to South America were introduced to its medicinal properties by the indigenous peoples of Peru, and so by the 18th century it was also widely referred to as ‘Jesuit’s bark’. Like so many of the active ingredients used in Georgian home remedies, it was believed to cure any number of ailments. Well known for its sobering, tonic and astringent properties, it was also given to patients to bring down a fever. 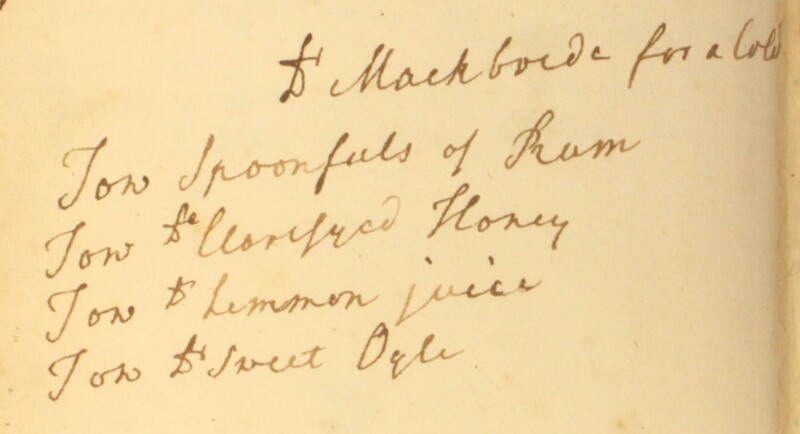 In this Regency recipe from Dr William Kitchiner’s Cook’s Oracle, it is made into a concentrate with orange peel and brandy, and then taken with water to settle the stomach. Peruvian bark bruised, an ounce & a half; orange peel [bruised], one ounce; brandy or proof spirit, one pint. Let these ingredients steep for ten days, shaking the bottle every day. Let it remain quiet two days and then decant the clear liquor. Dose, a teaspoonful in a wine glass of water twice a day, before dinner & in the evening. “Tea made with dried and bruised Seville orange-peel, in the same way as common tea, and drank with milk and sugar, has been taken by nervous and dyspeptic persons with great benefit“. Daffy’s Elixir was a well-known remedy, popular throughout the 18th and 19th centuries. Reverend Thomas Daffy (1616/17–1680) was responsible for the original version of this concoction, which was sold as ‘elixir salutis’, a cure for colds, fevers and stomach complaints. The recipe was passed down the family, and was soon picked up by other apothecaries. The brand of ‘Daffy’s’ was so strong that it was taken up by herbalists and chemists for their cure-all potions, even though their recipes sometimes bore only fleeting resemblance to the Reverend Daffy’s original. 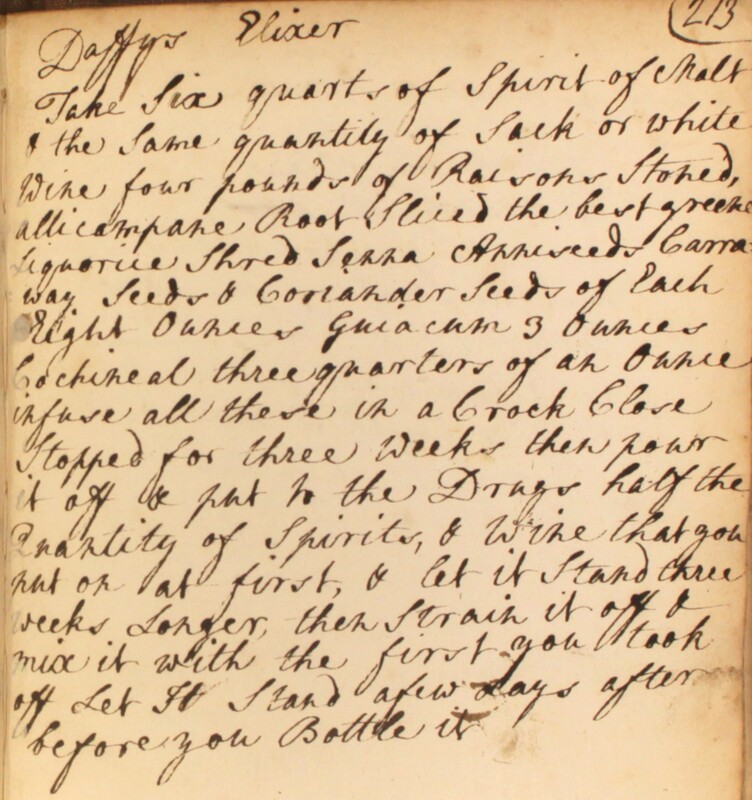 Take six quarts of spirit of malt & the same quantity of sack or white wine; four pounds of raisons stoned; allicampane root sliced, the best greene liquorice shred, senna, anniseeds, caraway seeds & coriander seeds, of each eight ounces; guiacum, 3 ounces; cochineal, three quarters of an ounce. Infuse all these in a crock, close stopped, for three weeks. Then, pour it off & put to the drags half the quantity of spirits & wine that you put on at first, & let it stand three weeks longer. Then, strain it off & mix it with the first you took off. Let it stand a few days after before you bottle it. Guaiacum, a type of wood, first brought over to England from Central America and the West Indies in the 16th century. Used in the treatment of sexually transmitted diseases such as syphilis, but used in excess it could turn the patient’s skin yellow! Perhaps Daffy’s elixir was useful for a spot of indigestion, or maybe even a cough of cold, but its effectiveness as a universal cure is doubtful!